How is it to complete a film within 51 days with such an ensemble cast? I am very happy to have each one on board. There were many changes initially, like my heroine, from Keerthy Suresh to Kajal Agarwal and from Nikki Galrani to Sunaina. But I am glad I am able to bring the best on board. I am really thankful to each one of them as they literally glorified my project. The shoot is over and I really miss working with them. They were like an extended family. I am looking forward to the release now. They are my close buddies. They have done a fabulous job and they both are extremely good actors. I would love to work with them again. In Kavalai Vendam, every character is equally important. For Bobby Simha, it would be like a game changer. He has played an entirely different character in my film. Be it his looks or character, he has molded himself totally to the part he played. Sunaina is a wonderful, beautiful and a talented actress. I feel she is the most underutilized actress. Was it a conscious choice to clash with Remo on October 7th? It was not my call, but my producer’s. I am excited. It is all about healthy competition. At the end of the day, I am confident about my project. I wish Remo all the luck and love. It is a wonderful script, something people would love to watch. They would relate to and laugh their hearts out. I try to incorporate comedy in my films as I feel people are stressed beyond words and I want my films to be like a therapy to them. 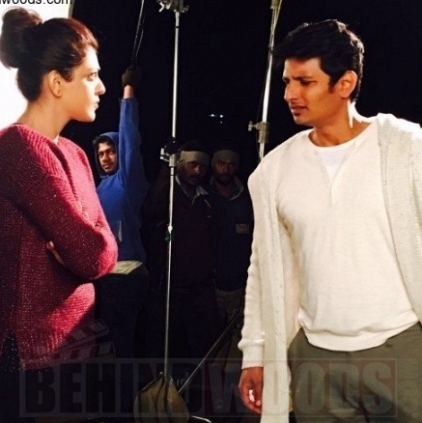 Kavalai Vendam will be a proper package of entertainment. I have a couple of scripts ready but it will be different from my earlier work. I would make it official post Kavalai Vendam.